The Sanremo pillows top mattress takes its cue in terms of appearance and dimensions from American mattresses. This made-in-Italy mattress provides an excellent mix of support, utmost transpiration and comfort, as well as healthy and long-lasting body rest. 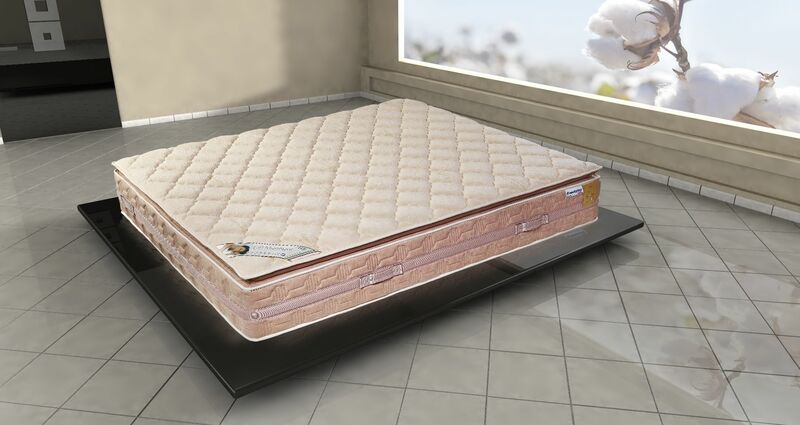 Sleeping quality stems above all from the benefits of memory foam, which accommodates the body, alleviates pressure points and distributes weight uniformly, and of the temperature-regulating Polygel in the topper, to increase both height and comfort. The exclusive “smart” spring system of the Pillow Top Cotton mattress has been designed to adapt to body movements during sleep and provide a perfectly adequate and personalized elastic response; there are 7 differentiated zones in which a greater or lesser number of springs have been fitted, conceived to provide the body with more decisive and comfortable support wherever necessary. Quilting is 100% organic cotton grown using low-environmental impact methods, without the use of pesticides and other toxic elements which could contaminate the product. The Pillow Top Cotton mattress provides constantly pleasant comfort.